A diver examines the gunner's forward turret on a PBY-5 Catalina resting on its right side in Kāne‛ohe Bay, Hawaii. 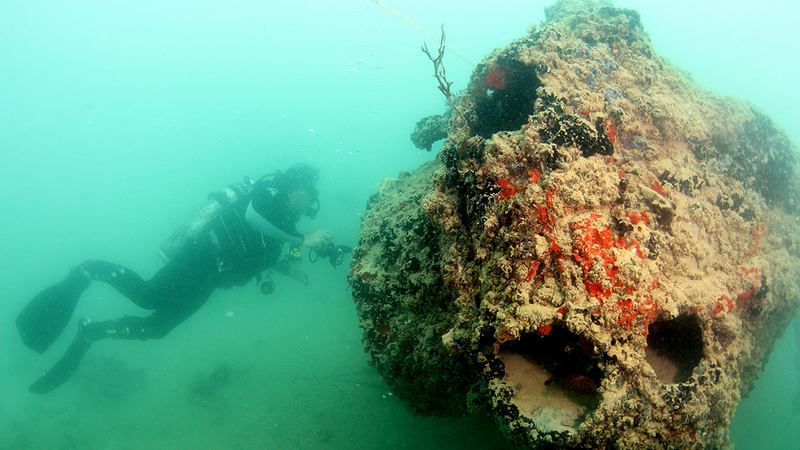 The plane was sunk at Pearl Harbor on Dec. 7, 1941. Credit: UH Marine Option Program. NOAA and University of Hawaii archaeologists released rare images of a U.S. Navy airplane sunk during the opening minutes of the Japanese attack at Pearl Harbor on Oahu on the morning of Dec. 7, 1941. The attack led to the United States’ entry into World War II. Minutes before attacking Pearl Harbor, Japanese Imperial Navy aircraft bombed the nearby U.S. Naval Air Station on the east coast of Oahu. Twenty-seven Catalina PBY “flying boats” on the ground or moored on Kāne‛ohe Bay were destroyed, and six others were damaged. The strike on the seaplane base was a significant loss for the U.S. military, as these long-range patrol bombers could have followed the Japanese planes back to their carriers. In 1994, Kāne‛ohe Bay’s murky waters thwarted a University of Hawaii dive team’s attempt to photograph the wreck of a Catalina PBY-5. A second effort in 2008 by a local sport diving group, Hawaii Underwater Explorers, also had limited success. In June, with better visibility and using improved camera equipment, a team of students from the University of Hawaii Marine Option Program returned to the wreck and conducted a detailed archaeological survey. The student effort was coordinated by Hans Van Tilburg, a maritime archaeologist with NOAA’s Office of National Marine Sanctuaries. This latest effort also produced the first systematic photo and video documentation of the entire site. Van Tilburg said while the precise identity of the aircraft remains unknown, it is possible the crew died while attempting to take off in the face of the attack. The plane, which rests in three large pieces at a depth of 30 feet, is protected by the Sunken Military Craft Act of 2004, which prohibits unauthorized disturbance of military vessels or planes owned by the U.S. government, as well as foreign sunken military craft that lie within U.S. waters. The University of Hawaii Marine Option Program is the only institution that offers maritime archaeological survey training to undergraduates in the Pacific. The survey course, known as MAST (Maritime Archaeology Surveying Techniques), teaches marine scientists how to document significant but little-known World War II historic artifacts and other types of submerged sites. To see photos, video and other materials, visit http://sanctuaries.noaa.gov/shipwrecks/pby-5/.